Combine steak, 1 tbsp shoyu, and sesame oil in a zip-top bag. Seal bag, removing all air, and gently message bag to ensure steak is covered in mixture. Chill to marinate at least 2 hours and up to 12. Combine stock, 1 c water, shiitake stems, ginger, lemongrass, and garlic in a large pot. Bring to a simmer and cook 15 minutes. Do not boil. Lower heat and keep warm. Meanwhile, heat a medium cast iron skillet over medium high until very hot. Add oil and swirl to coat. Add steak and sear until browned, about 4 minutes. Turn steak and add Brussels spouts to skillet in an even layer around steak. Cook steak another 4 minutes (to about 150°F for medium); remove steak to a cutting board to rest. Thinly slice shiitake caps and add to skillet with Brussels sprouts. Cook, stirring often until mushrooms and Brussels sprouts are browned and softened (Brussels sprouts will still be somewhat firm), about 5 minutes. Remove to a bowl and set aside. Scoop shiitake stems, ginger, lemongrass and garlic from stock with a slotted spoon and discard. Place miso in a small bowl and add ¼ c hot stock; whisk until dissolved. Set aside. Bring stock to a boil, add noodles and cook 4 minutes. Divide noodles between two bowls, reserving stock in pot. Stir miso mixture into pot and return to heat. Bring to simmer and cook 2 minutes. 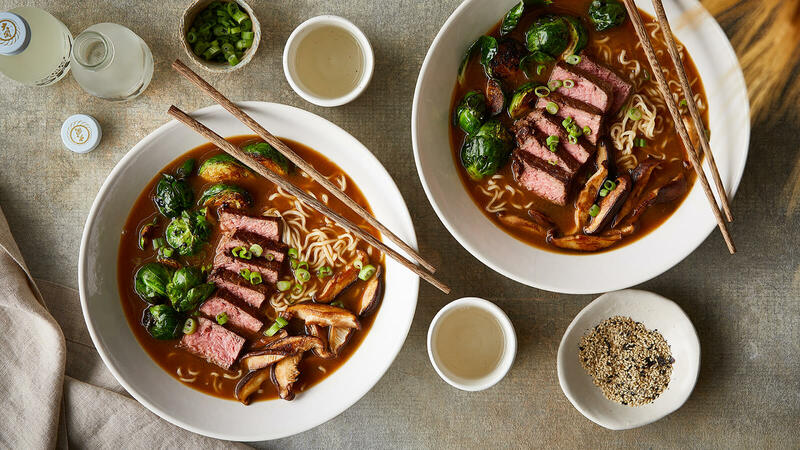 While stock is heating, slice steak and place over noodles, along with Brussels sprouts and shiitakes. Remove stock from heat and stir in rice vinegar and remaining 2 tbsp shoyu. Pour over bowls and sprinkle with green onions.